Posted on Sunday, February 10th, 2019 at 3:06 pm. Seattle-The Alliance of American Football league has captured the eyes of the world, because of the new rules, regulations, and even the storylines that some of the players had to endure to even make the roster. Last night the AAF opened up with a bang. There were two games that had gotten a lot of fan interaction. The Orlando Apollos won big against the Atlanta Legends 40- 6, while the San Antonio Commanders won in a thrilling game over the San Diego Fleet 15-6. Both games had a course of defensive stops and some amazing plays down the field. A lot of fans kept commenting that the refs let the guys take some hits and did not throw the flag like the refs would have done in the NFL. “Did you see the hit that the QB took, man it wasn’t helmet to helmet or anything? It was a clean shot and that is something the NFL needs to take a look at,” said an anonymous source. However, there were a couple of football fans that said that it looked like another semi-pro league and it did not catch their eyes, because they have seen it before. However, maybe fans like the idea of the AAF, because it is more football to watch until the NFL comes back on. 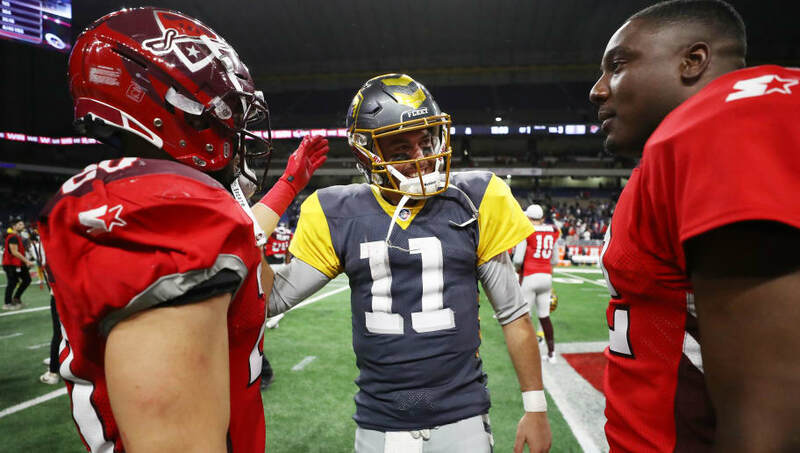 In a CBS viewer rating, there were 2.9 million people who tuned in on the AAF’s opening night. We shall see if ratings will increase or decrease in the upcoming weeks, but a lot of people are saying that this league has a lot of potentials and want to see how it will expand in the next five years.